Many of you probably read my post about Mindware last month. They are a company that creates fun eductional toys for kids of all ages. Their product line includes educational toys, games, brainteasers, creative play activities, building sets, coloring books and more. Over the years, their toys and games have won many prestigious awards from Mensa Select, Good Housekeeping, Parents' Choice and the Spiel des Jahres in Germany which is a huge honor. I am teaming up with The Review Wire to bring you this wonderful giveaway for a Paint Your Own Stepping Stone. These fun stones can be created any way your child, or you, would like. This all-weather stepping stone is ready to paint right out of the box, letting you skip messy cement-mixing and get right to the fun part: decorating and personalizing! A dozen vibrant paints allow for endless creativity—mix, blend and add custom color accents. Once painted, bake the stone in your oven for a long-lasting, weather-resistant finish. Display one stepping stone or make a whole pathway to transform your garden, backyard or patio! Kit includes a 10" x 9" cement stepping stone, 12 paints, a paintbrush and instructions including a color planning template. 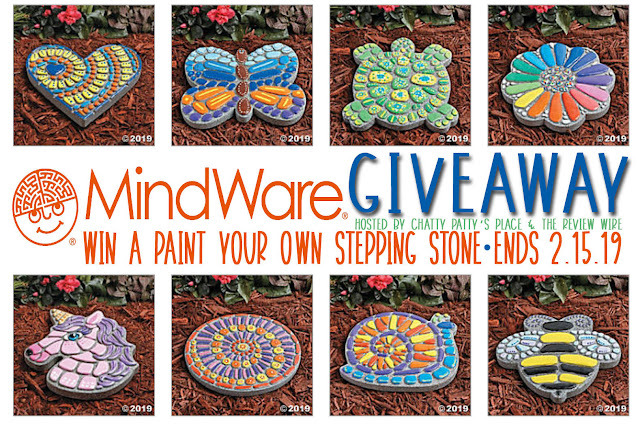 I would really love the butterflys stepping stone! It reminds me that I need to let my daughter try out her new wings! I would choose the unicorn. This would be a gift for my daughter and she likes unicorns! I would choose the heart and paint it with a tie-dye look. I would love to have it as decoration when I set up as a vendor as festivals and fairs. I really like the heart stepping stone! My daughter would be able to choose wonderful colors for this. She is quite an artist. It would look lovely by my home. Thank you for sharing. Love this.